Return on Investment begins immediately! A Radianse System is personalized to fit your specific business needs. 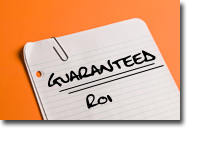 We are so confident that you will achieve a return on investment, we guarantee it. A Radianse System delivers a measurable return regularly seen within the first 12 months. Follow our three phase consultative approach for process assessment, site analysis, and site implementation, and you will promptly see a return on your investment. Businesses using a Radianse System platform for asset monitoring quickly see gains in productivity, satisfaction and safety. The savings start right away – savings that you can apply to improving overall efficiency. When being used in hospitals, for example, the Radianse System proved to have returns almost immediately. Brigham & Women’s Hospital: Proves a 50% reduction in lost equipment in a pilot program, leading to hospital-wide coverage. PinnacleHealth: ROI came in about 12 months. Documented savings of $900,000. People depend on it to find what they need when they need it. University of Pennsylvania Health System: Real-time Asset Utilization has delivered in cost-savings, efficiency and improving the patient experience. Track returns for your business – Start with this checklist to see where you can save money and time with a Radianse System. Businesses are constantly under pressures of needing to save money, increase efficiency, and improve overall outcomes. The Radianse System supports each of these needs, contributing to a business’ return on investment. Hannibal Regional Hospital: 105 beds, achieved ROI within the first year based on increasing OR utilization, reducing overtime, and improving inventory management. Massachusetts General Hospital: The renowned academic university, increased productivity, automated manual tasks, improved overall satisfaction and measured an initial increase in throughput greater than 40 percent. A Radianse System offers many ways to achieve a fast return on investment for your organization. With Radianse, you can apply efficiencies gained and information gathered for evaluation and action among contributing ROI factors. Track returns for your business – Use this chart to identify other ways to maximize your return. © 2019 Radianse, All rights reserved.